In my dream of opening a cupcake shop, I thought it would be the cutest idea to make cupcakes for dogs and call them pupcakes. Apparently lots of other people thought that would be super cute because there are already multiple bakeries around with pupcakes. I guess I’ll just have to stick with cupcakes for people. Besides, dogs can’t eat chocolate which would mean I’d have to make them out of carob, and no one really likes carob anyway. After years of talking about our love of puppies, my friend/coworker Kristin got herself a golden retriever puppy named Bodhi. 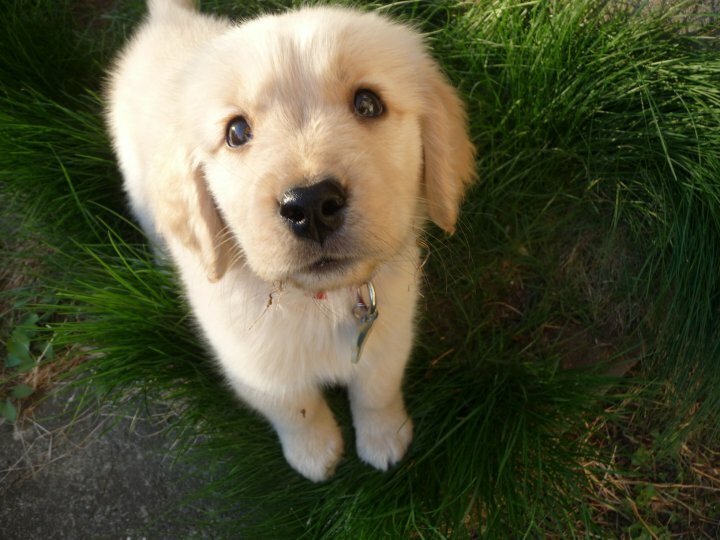 GAWD is he just the cutest thing you’ve ever seen! I mean I’m serious when I say he’s so cute you want to die. You have to see him, so I went and stole a picture from her Facebook page. This is my absolute favorite of him because he looks a little like he’s in a fisheye lens and he has a little grass stuck to his lip. Kristin and her husband had a puppy party to introduce little Bodhi to all of their friends (and to drink some sangria on a Sunday afternoon). I was more than excited to go and spend some time with her cute little man (the puppy, not her husband). Of course I have to bring cupcakes to the shindig because well, that’s what I do. Again, I made the one bowl chocolate cupcakes but topped with with Kristin’s favorite frosting. This is a mousse-like frosting and always gets compliments from people. Make pudding according to the directions with the 1 cup of milk rather than the 2 cups the package states. Fold in thawed Cool Whip. Mix in food coloring if desired. 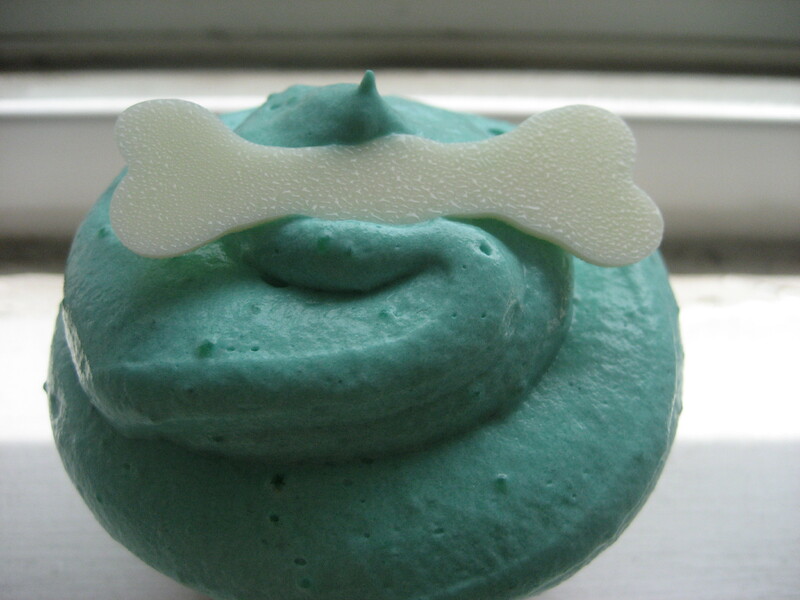 The cupcakes had to be garnished with a white chocolate bone because they would be puppy celebration cupcakes without some kind of dog relate thing on there. I had printed out some clip art of bones and covered with wax paper to I could pipe the melted white chocolate on. Since the bones look the same on both sides, unlike letters, you can just turn them over when you put them on the cupcakes so the smooth side is facing up. The cupcakes were a hit. I absolutely love the frosting on these cupcakes, and everyone else will too. Don’t even tell them it’s made with instant pudding and Cool Whip. You have to fake it and say that you made mousse for the frosting. Trust me, they’ll believe you. Don’t you love having friends or family who live in a great vacation spot? My niece and nephew live out in Lake Tahoe, and I love going out to see them since it’s so beautiful out there. Even better though is when they make their once a year pilgrimage to the east coast for their multiple state visit. This past fall when they came for their visit, it was just after my niece’s 3rd birthday and we were also going to have my nephew’s Christening so it was the perfect excuse for me to make a bunch of cupcakes! For Z’s Christening cupcakes I thought it would be best to keep it simple and wow the crowd with the presentation. I went with the Martha one bowl chocolate cupcakes (yes, again!) with a buttercream frosting and white chocolate lettering. For her birthday, I kind of wanted to give C a funfetti cake (my absolute favorite boxed cake), but lets face it, cupcakes are much more my thing and everyone pretty much expects me to bring cupcakes to a party. I’m assuming at this point in the blog we don’t need to go over the chocolate cupcakes, I’ve probably posted about them at least three times now. I told you I loved them! I made a basic buttercream frosting because to be honest, I tried to make the Swiss buttercream for both but ran out of ingredients for a second batch. I used the recipe from allrecipes.com but used all butter instead of putting shortening in. Personally, I’m not too much of a fan of using shortening in frosting unless I’m using vegetable shortening in a vegan frosting. I’ve found that the shortening leaves a funny feeling in my mouth after that I don’t like. I think it’s okay in a vegan cupcake when there are less options out there but I wouldn’t recommend it in everyday cupcake frostings. When I started making cupcakes, I bought some concentrated food dyes so that I could decorate in pretty colors. These are great because you only have to use a few drops of coloring to get a nice color. 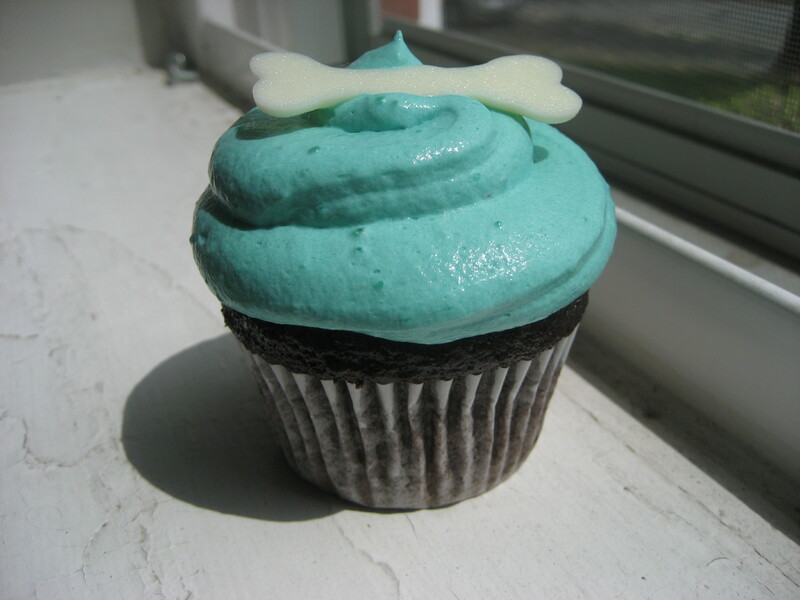 I love the color of these cupcakes; they almost came out a Tiffany blue when I colored them. 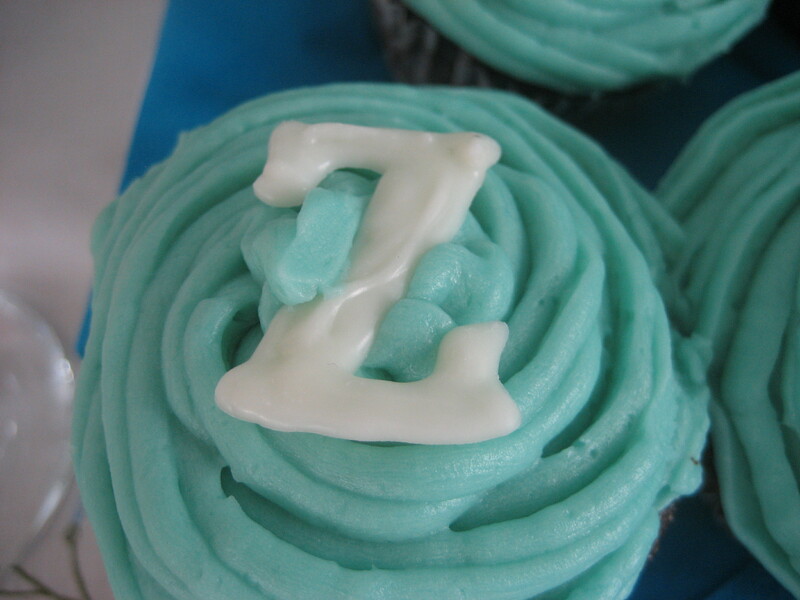 Chocolate letters look great on top of cupcakes, and are super easy to make. All I had to do here was print out what I wanted to say and cover with wax paper. Then just pipe melted chocolate onto the wax paper and let harden and people will be ahhhhing over your pretty spelled out letters. Lesson: if you want your letters to be smooth, you MUST pipe them backwards so they can be turned over when put on the cupcakes. You can see in the picture with the big Z that they are a little bumpy, which they wouldn’t have been if I had thought first to do them backwards. Since I love funfetti cake so much, I figured I’d make everyone else love them whether they liked it or not. I’m going to share a secret with you here, so don’t tell anyone…I would pick boxed funfetti cake with rainbow chip frosting over almost any homemade cupcake. Shhhhhhhhh!!!!!!!!! This must NEVER be repeated outside of this blog. Moving on. Giant cupcakes are not as easy to make as they look. I used a basic buttermilk cake recipe and added rainbow sprinkles to make it funfetti (pretty easy, right?). I made this cake, took it out of the oven, put it on the cooling wrack and saw liquid cake batter dripping from it. Obviously you’re thinking I should’ve tested the cake before I took it out but I swear I did! The toothpick came out clean but somehow there was still raw cake in there. I really have no idea how this happened. On my second attempt, I mixed everything together and got the cake in the oven baking before I realized that I forgot to put oil in the cake. Duh!! Sometimes you just have to go with the mistakes, so at this point I just went with it and figured I’d see how it turned out. The cake turned out a little dense but it still tasted good, and you know what? I hate wasting good ingredients, so I wouldn’t have been happy throwing two cakes away. 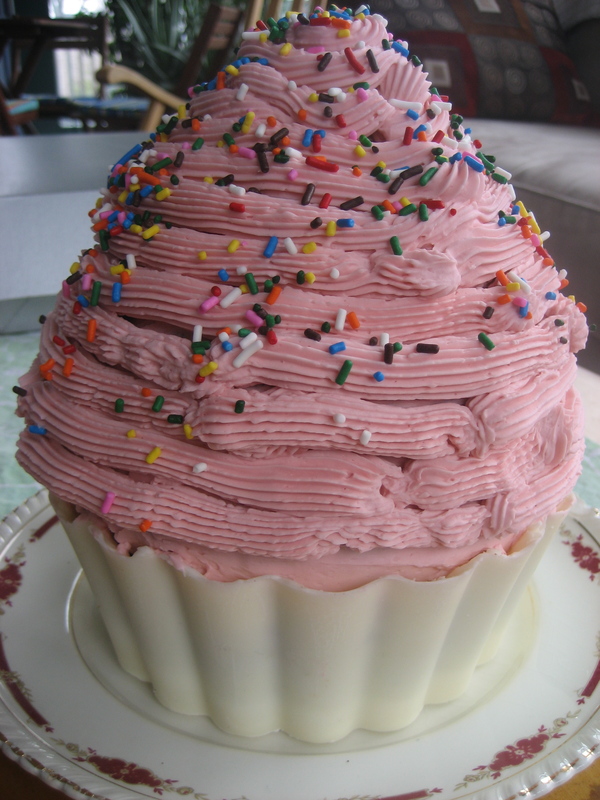 From the pictures I had seen of the giant cupcake, I just didn’t like the look of the whole cake covered in frosting. 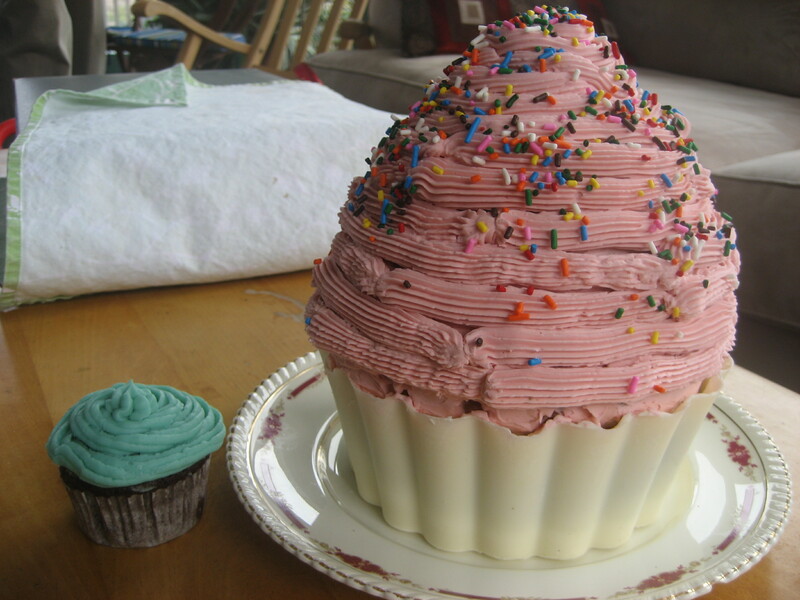 I had found a giant cupcake candy shell on oh, sugar! and loved the look because it made it look like the cupcake was in a wrapper. It was super easy to do too as long as you follow her directions step by step. Cover the giant cupcake in some Swiss meringue buttercream (which was hard to pipe on in a continuous circle, hence the gaps there) and throw on some of those leftover sprinkles and you’re good to go. 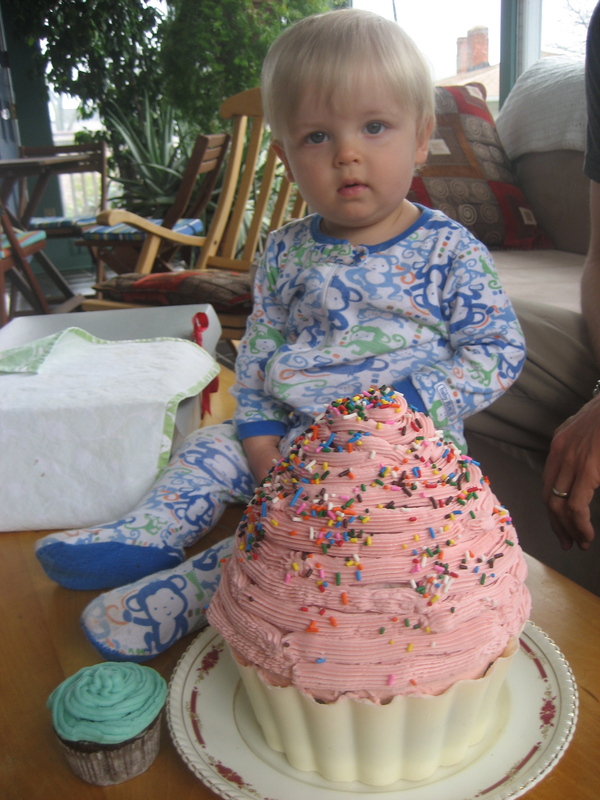 This is one of my favorite pictures of the cake, cupcake, and my nephew. How cute is that little man?? I can’t even tell you how hard it was to get him to sit there and not stick his hand in the frosting, but we got him there long enough for a photo shoot. I’m pretty sure he enjoyed those chocolate cupcakes, as did the rest of the party. This weekend I’m going to be diving into a new cupcake adventure…strawberry basil cupcakes! This is going to be a great summer cupcake, I can’t wait!